ALBUQUERQUE, N.M. -- Albuquerque police overreacted during a 2014 standoff with a homeless man armed with knives and then intentionally killed him, a special prosecutor said Monday as the long-awaited murder trial of two former officers got underway. “All of these shots were no accident or a mistake,” special prosecutor Randi McGinn said in her opening statement about the shooting that set off protests in a city whose police force was under federal investigation. Defense attorneys for now-retired Keith Sandy and former Officer Dominique Perez told jurors that dispatchers warned officers to use extreme caution given that James Boyd had paranoid schizophrenia as well as an extensive criminal history of aggravated battery against law enforcement in New Mexico and elsewhere. Segments of police video played by the defense showed an agitated Boyd threatening to kill officers numerous times that March day. The case is about a clash between the duty of police to protect the community and assessing the danger Boyd posed, defense attorney Luis Robles said. He said Boyd was asked to surrender his knives 33 times but didn’t. “He was shot with his knives in his hands,” Robles said. Testimony will unfold over the next two weeks amid the national debate over police use of force, which has largely focused on race but also raised questions about deadly conflicts with those who are mentally ill.
A month after Boyd’s death, a harsh report from the U.S. Justice Department found Albuquerque police too often used deadly force on people who posed a minimal threat and used a higher level of force on suspects with mental illness. City and federal officials have since agreed to overhaul the police agency with court-mandated reforms, including new use-of-force procedures that focus on de-escalating crisis situations. Sandy and Perez were charged with second-degree murder in January 2015 - a year in which at least 15 other officers nationwide were charged with manslaughter or murder, up from the average of five per year over the previous decade. 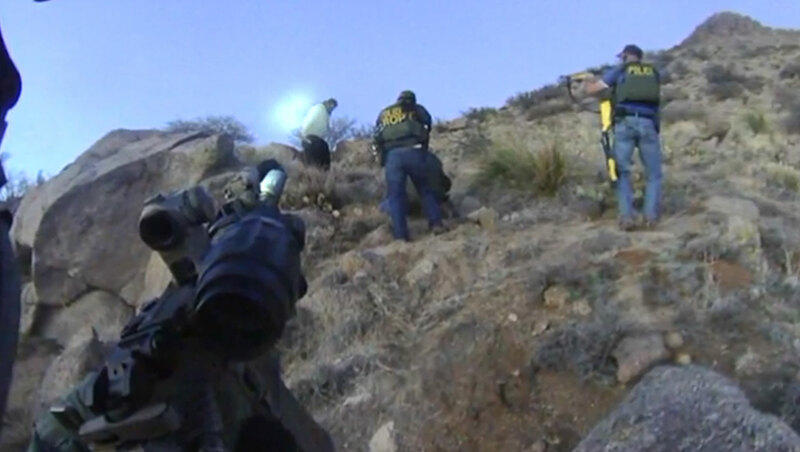 Video from officer helmet cameras appeared to show Boyd preparing to surrender when police opened fire, ending a nearly five-hour standoff in the foothills of the Sandia Mountains that drew 19 officers. The situation unraveled as a flash grenade went off near Boyd. Officers then approached him, and he reached for two pocket knives. He was shot seconds later. McGinn argued that a “paramilitary response” created a dangerous situation that led to Boyd’s death. The video sparked unrest that shut down streets and City Hall, offering an early look at the anger over police use of force that would sweep the U.S. later in 2014 following shootings in Ferguson, Missouri, and elsewhere. There were no protests Monday outside court, but tactical officers were positioned atop a building across the street to monitor as people made their way into a nearly full courtroom. Jurors must weigh whether Sandy and Perez justifiably perceived that Boyd posed a life-threatening danger to other officers as they surrounded him. The former officers’ lawyers say they opened fire to protect a K-9 handler standing closest to Boyd, and they were obligated to shoot as their training required them to do. McGinn raised questions about whether officers followed protocol during the standoff and suggested that Boyd was not a threat. If convicted of second-degree murder, the former officers, who were not jailed ahead of trial, face up to 15 years in prison.